When it comes to summer dance offerings in the San Francisco/Bay Area, every year is different – sometimes there is a ton of great stuff to see, and in other years, not so much. But there are a few ‘must-sees’ every summer, and Post:Ballet is definitely one of them. 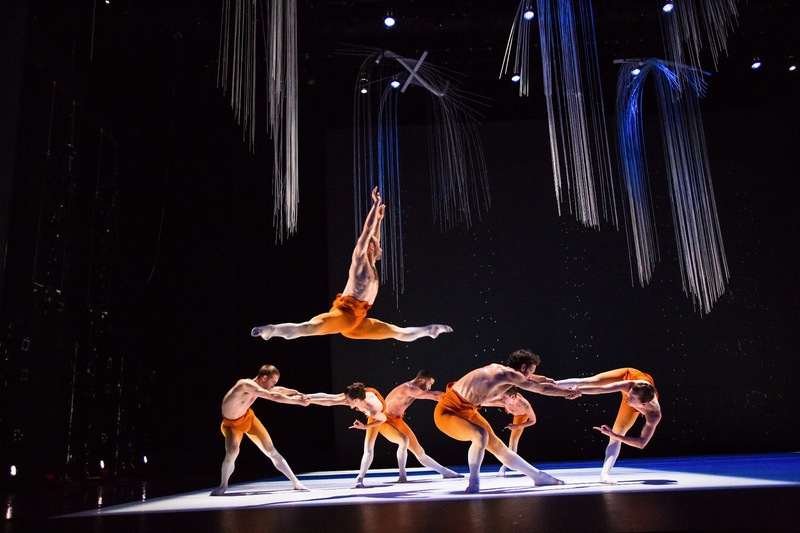 After showing previous years at the Cowell Theater and the Herbst Theater, Post:Ballet opened its fourth home season at Yerba Buena’s Lam Research Theater. Aptly titled “Four Plays”, the collaborative mixed repertory program revealed Artistic Director Robert Dekkers’ creative genius and the off-the-charts talent of every Post:Ballet dance artist. The evening’s first three pieces came from the Post:Ballet choreographic archive: 2011’s “Colouring” and “Sixes and Seven” along with 2012’s “When in Doubt”. An interdisciplinary work, “Colouring” is all about process – the process of building material; the process of melding it together; the process of interdependence; the process of experimentation. Throughout the performance piece, different practitioners (choreographer, dancers, visual artist, musician, photographer) interact in real time. Not only is this a cool and fresh approach to artistic collaboration but also gives the audience a glimpse at what happens behind the scenes. A solo that oozes duality, “Sixes and Seven” features choreography that is delicate and internal yet vast and sweeping at the same time. Impeccably danced by Jessica Collado (at Thursday’s performance), “Sixes and Seven” contains a delicious element of mystery to it. The soloist is taking inventory of her surroundings yet seeing something that the audience cannot; sharing part of her world, but keeping some things to herself. “When In Doubt” examines collective co-existence – how we adapt, how we imitate, how we work together and how we stay true to ourselves in the midst of community. The dance is maybe a little too long, and much of the movement and staging seems similar. Having said that, the two main trios stood out for their narrative depth and choreographic ingenuity. Jane Hope Rehm, Aidan DeYoung and Ricardo Zayas were up first. Throughout their variation, Rehm was pulled, dragged and manipulated into various positions, almost like a puppet or doll. But as the trio continued, it became clear that she was not at all a passive player. Rather, this was bravery – a showing of complete trust and utter vulnerability between three people. The second pas de trois - danced by DeYoung, Zayas and Christian Squires - performed the exact same choreographic phrase but not in exact unison. From an audience perspective, this can often feel a little unsettling. Was the section under-rehearsed? Was one of the dancers just out of sync? In this case, the lack of unison was purposeful; it was serving the narrative. Here was a significant comment on individualism – the dancers were cycling through the same choreography but in their own time, at their own pace. Though not my favorite piece, “When In Doubt” certainly had these deep moments of clarity and meaning. Act II brought the premiere of Dekkers’ newest work, “field the present shifts”, a piece that blended his signature choreographic style with chance processes. Set amidst a field of gorgeous dangling sculptures, “field the present shifts” had a somewhat scientific opening. Over and over again, dancers clustered in small groups and then broke apart into the space - scattering and re-adhering. It felt like watching particles react under differing circumstances and changing states. A slow, meditative section followed, accompanied by constellation-style video graphics on the back wall. In this segment, the dancers carved out positions in the space, like sculpture. With each extension, attitude turn, and arm movement, at every level of intonation and point of articulation, the resistance in the space was tangible. Again, many of the unison sequences varied, with some dancers taking longer in a turn or holding a position for a shorter duration. They were all staying in the moment and exercising the freedom they had been given to alter the phrase. One interesting result of these ‘faux unison’ moments was that it allowed the audience to really choose who they were going to watch. Every dancer was identifying themselves as part of the group, but also as individuals. The penultimate vignette found the music in rallantando, the sculptures being lowered to the ground and the movement slowing. This sequence was steeped in emotion – awe, relief and a little bit of sadness. Though it almost felt like the work was ending here, it was only a moment of repose, of suspension, of unresolved cadence before the recapitulation of the opening theme. “field the present shifts” was a gorgeous piece of art – stunning choreography, incredible visuals, inventive lighting and brilliant dancing. The only downside was the costumes – the variegated color looked a little strange (though the bright orange was fantastic) and there was an odd ruffle in the design. They just weren’t particularly flattering. Heather, your writing and criticisms are impeccable. Yet you neglected to mention the live music for "field the present shifts", which I found equally amazing and an ingegral part of that amazing piece. Matthew Pierce's new score, performed live with 4 other musicians, was magical, mysterious, atmospheric and very much contributed to the overall effectiveness of the piece.